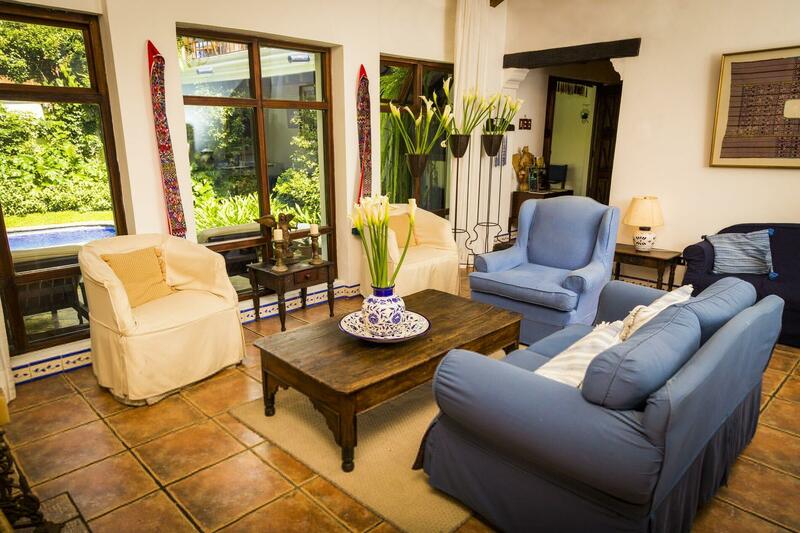 Casa Encantada is one of the most intimate and relaxing boutique hotels in Antigua, Guatemala. 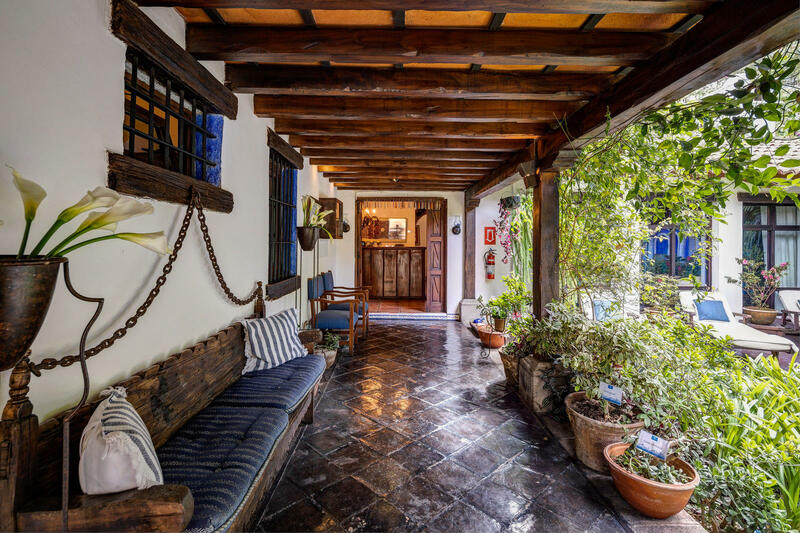 Step past the traditional timber and iron door welcoming you from the cobblestone street and discover the quiet, calm and warmth of a private residence. 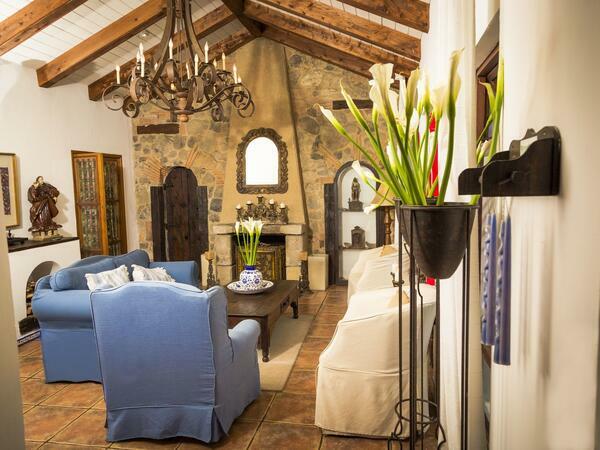 Rustic yet elegant architecture and charming décor create a deep sense of tranquility and seclusion. An inviting interior garden courtyard features a small pool and lounge chairs. This understated gem offers every convenience sought by the discerning traveler, nine beautifully decorated rooms and a magnificent rooftop suite; a terrace with a bar lounge and breakfast dining. 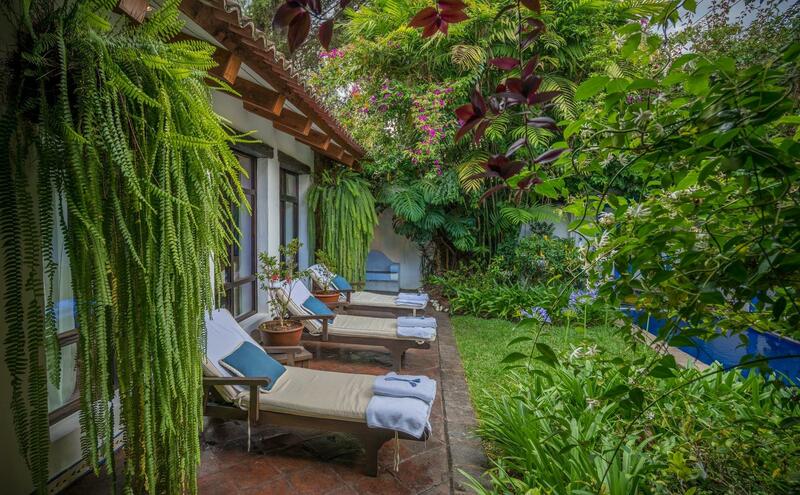 Casa Encantada is tucked into the heart of La Antigua, Guatemala on a residential avenue that manages to feel far removed from tourist distractions and noise despite being just four blocks from the bustling Central Plaza. On our rooftop terrace, you can enjoy a cocktail or a glass of wine as you bask in enchanting views of the mist-shrouded Agua Volcano, located just beyond the city limits. Step outside and Central America’s finest dining, nightlife and shopping are a short stroll away. Also within walking distance are the markets of the artisans, the National Museum and scenic avenues lined with beautifully restored ruins, convents and churches. Nearby attractions include the Mayan ruins of Iximche and the Pacaya Volcano. The market town of Chichicastenango and the majestic Lake Atitlan can be accessed by private car or shuttle. Throughout your stay at Casa Encantada, you’ll enjoy the personalized attention of hosts who understand how to anticipate without intruding. 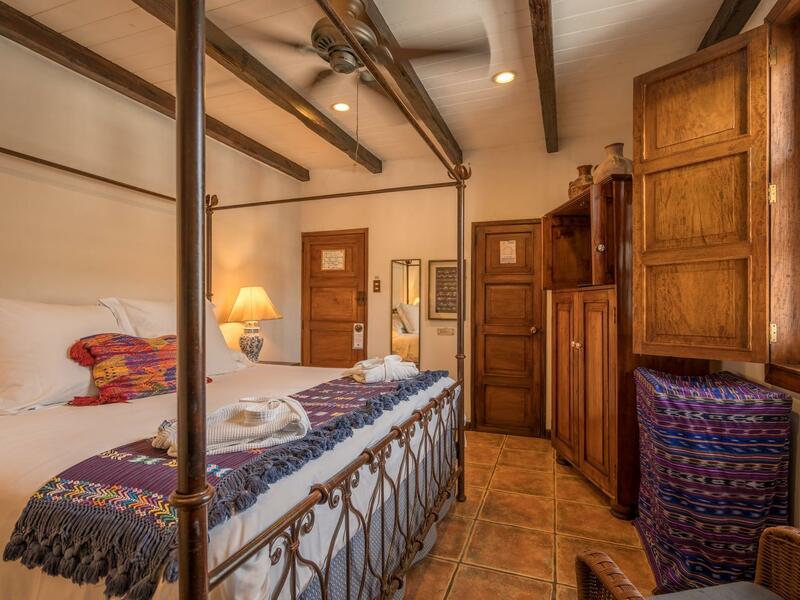 But the best gift of all is the privacy and freedom to explore La Antigua at your own pace. 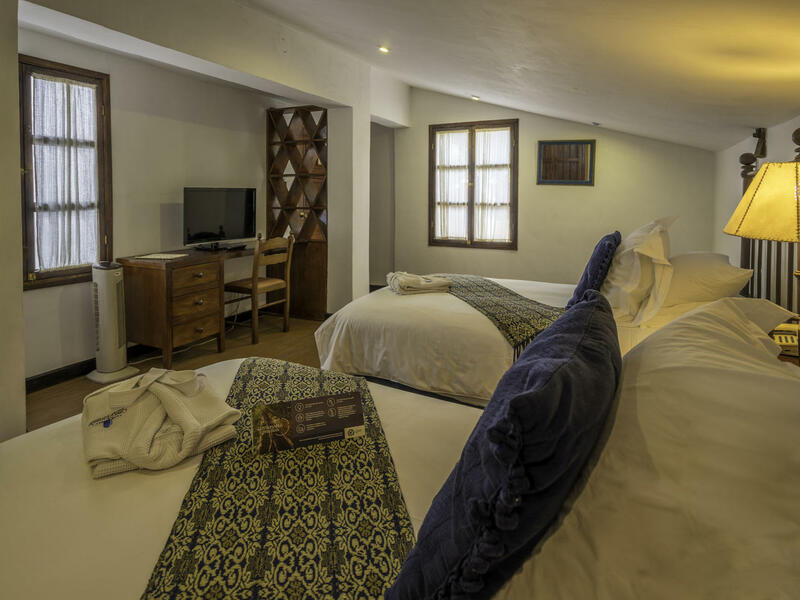 On your next visit to La Antigua, we look forward to welcoming you to the city’s most charming, exclusive and authentic boutique hotel – Casa Encantada. Measuring 225 square feet, this room is furnished with a custom-designed wrought iron King, Queen or double bed, a feather down comforter, multiple pillows, fine linens, a mini bar, a safety box and a flat-screen TV. The bathroom has natural stone accents with walk-in showers, signature bathrobes and Italian amenities. Also, the guest room exterior windows have been double-paned to ensure a quiet peacefulness. 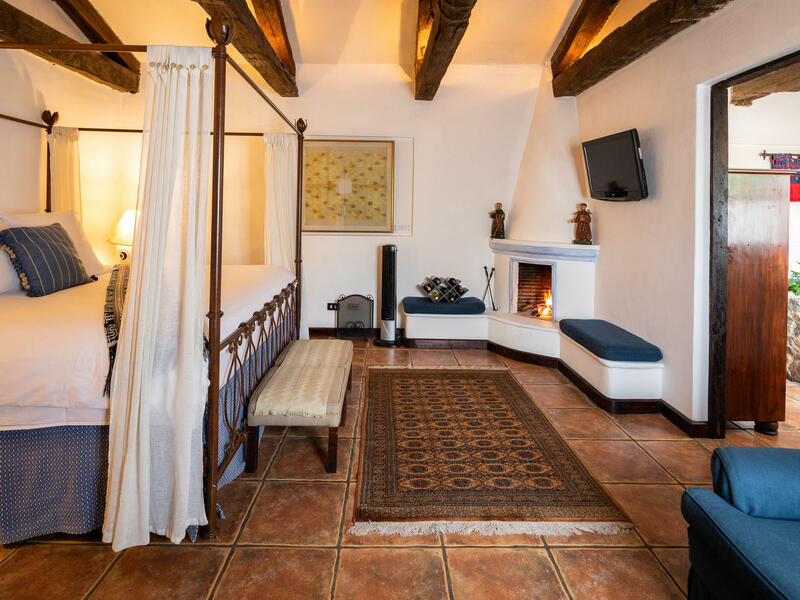 This 172-square-foot room on the rooftop terrace is a combination of European style and Antiguan décor with a private collection of framed ceremonial huipils adorning the walls, two double beds, feather down comforters, multiple pillows, fine linens, a safety box and a flat-screen TV. 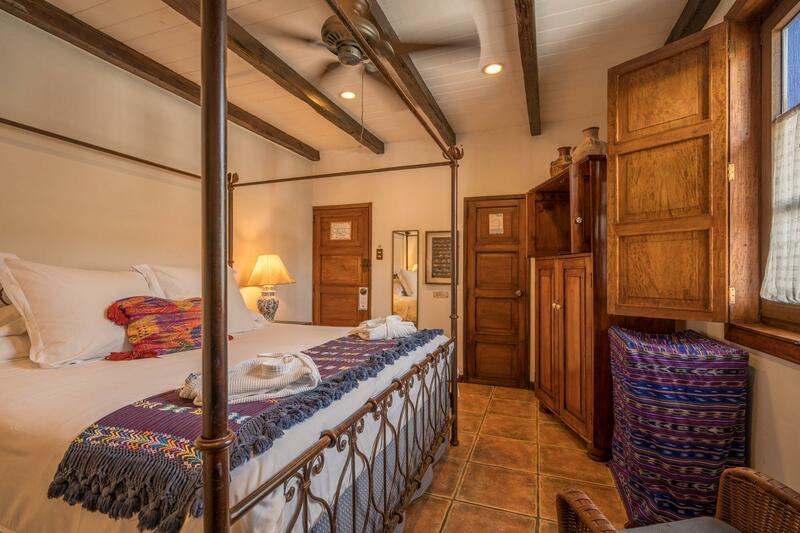 This fabulous master suite on the rooftop terrace offers a large bedroom and a sitting room configuration featuring a custom designed, four-poster wrought iron King bed piled high with down pillows and comforters all wrapped in fine Italian linens. With our tranquil interior garden and rooftop terrace overlooking the volcanoes, mountains and Antigua’s colonial skyline, we offer an enchanting setting for wedding ceremonies and receptions of up to 45 guests. Pamper yourself during your stay at Casa Encantada with a Swedish massage and an aromatic exfoliation of species in Ceiba Spa’s couples room. Ceiba Spa is located steps away at our sister hotel, Porta Hotel Antigua. Our rooftop terrace offers stunning views of the volcanoes, mountains and Antigua’s colonial skyline. It’s the perfect spot for our complimentary breakfast or sunset cocktails.